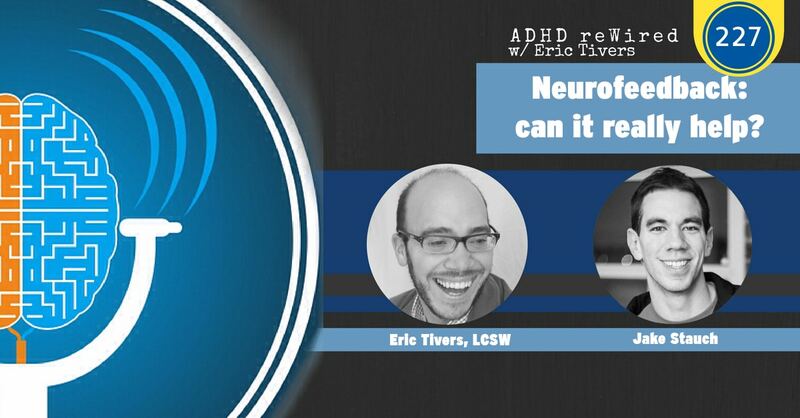 227: Neurofeedback – Can it Really Help? Joining me on the podcast this week is Jake Stauch. Jake is the founder and CEO of NeuroPlus, a company that has developed a platform for helping ADHD children and adults with brain sensing technology. Prior to NeuroPlus, Jake founded NeuroSpire, which used brain scans to test advertising effectiveness. Jake previously worked at Duke Center for Cognitive Science. He’s been named to the Forbes 30 under 30. His works have been featured in Rolling Stone, Popular Science, and IEEE. Brain activity is different for individuals with ADHD and neurotypical individuals, and Jake and his company, NeuroPlus, are working in the world of games with neurofeedback. In this conversation, you will hear Jake talk about the science, the questions, and the research they have seen in this area. [05:22] – Jake explains how he got into this realm, and why he calls himself a skeptic. [07:37] – Jake says that what NeuroPlus is doing is geared towards both children and adults. [08:13] – Jake provides us with a summary of where the research is right now with neurofeedback. [14:17] – Jake explains some problems with the way neurofeedback is done. [16:25] – I read a piece of an article that I found in researching for this episode. Jake shares some thoughts on that information. [19:50] – I read another passage from an article that speaks to the effectiveness of neurofeedback. Jake responds to some of these questions around neurofeedback. [23:30] – Jake talks about the risk for people looking to explore neurofeedback. [26:48] – Jake explains some of the mindset behind marketing neurofeedback. [28:13] – Jake describes some of the challenges with implementing the science and research with the delivery of the product. [34:39] – Jake talks about Calypso, which is one of the games I experienced. [37:44] – During the game, my mind wandered, but it said that I was focused. Jake explains what was happening. [39:34] – We talk about the idea of seeing brain waves during the games. [41:55] – Jake explains that he started this company, and how they are not popular with other companies in the space. [44:00] – When asked about data, Jake says that because of privacy protocols, they actually do not currently store raw brainwave data. [45:18] – Jake is looking for participants and researchers. [47:35] – Jake talks about how the company would handle things if the product were discovered not to be effective. [48:37] – We talk about how this technology could be introduced into popular games. [50:16] – Jake talks about the future of his business.